I appreciate that timing and consistency have a lower weight for DScore, but it doesn't change the fact that the logic is flawed, timing would be difficult to improve, I don't have alternatives, but consistency... is simply not stating consistency. Do you want to rate the consistency of a trader and learn if he is trading in a stable way following the same rules? They just have to track them with a monthly channel like now they are tracking VaR. What about range trader for example. If risk awerse trader, he or she will stay away in trending markets and trade fully in ranging market. So obviously there will be lack of consistency regards number of trades. As market changes so does consistency to some degree. So another example, one is trading certain levels only. Trader can be very consistent with executing the strategy, but he won't be consistent with duration of the trade, time of execution (morning, midday, night) as also regards pips. We can simplify consistency as it is now, wich can give some valuable insight, we can also add some new calculations (again it will be another simplified version) but it will never show the whole picture. My favorite consistency to watch is actually LA + daily drawdowns especially for daytrading style. How is trader managing situation when things are not so rosy. My KVL is a mean reverting swing trading strategy and trades all the day, trading all the day is consistent. European Session percentage is 50% on 1y , 6m and 3m , so trading routine is consistent. Going from night scalping to swing trading would mean changing strategy and that would be unconsistent. Agree, and this is the main flaw of the current consistency, it focuses on single trades and it is useless to identify the kind of strategy and ruleset. With my idea numbers tracked are not related to single trades but are calculated from tens/hundreds of trades. Even if duration of single trades may change a lot, the average duration will change only if you completely change your strategy. Diagrams are still very slow. 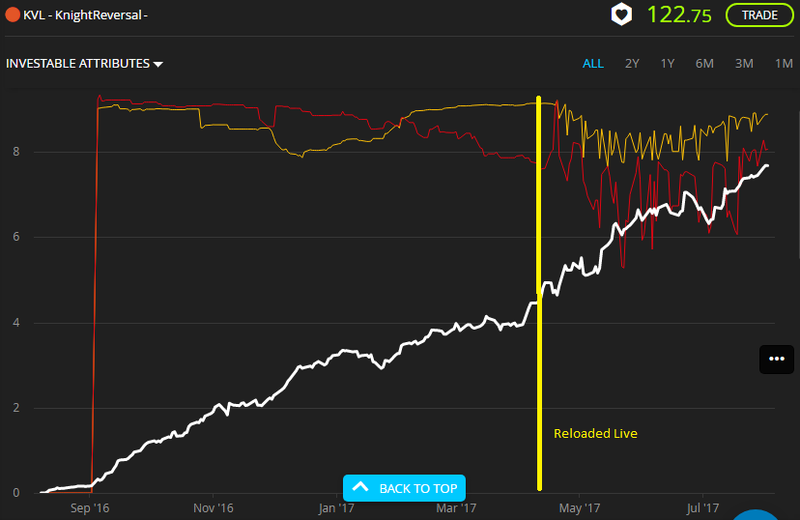 History/chart of R+ R- is often very noisy for the live part (after april). Let me check the speed issue with our engineers. Could you please be more specific about it? It happens also with many other darwins. I´ve been checking this post-reloaded noise you highlighted. First of all, let me assure you that we have not modified anything with regards to our R+/R IA algo. However, we´ve altered the way we calculate these grades (we do it with deltas now). This might be one of the reasons causing this "ugly" oscillations in the chart. We´ll take a look at this but we don´t consider this a priority at the moment. I agree that it isn't so importat but it reflects some complaints I did during the first days of Reloaded. Scores were changing even by 2 points from morning to afternoon. IMO the calculation is right but it needs to be smoothed/averaged to behave like the backtested region. I think this should be the goal of Consistency scores. The weight of R+, R- and Dc are not that low. You know that I cannot disclose more info about how the D-score is calculated but trust me when I say that the weight of those 3 is not that insignificant. if we want to penalize people pasting strategies together we need something that tracks a consistent behaviour, not durations or returns of single trades..
R+, R- and Dc does not take into consideration individual trades but positions opened in the same asset & same direction. Yes I know, but moving the algo from trades to positions isn't solving problems with a simple trailing stop. Honestly... do you think consistency scores are rating a stable ruelset?